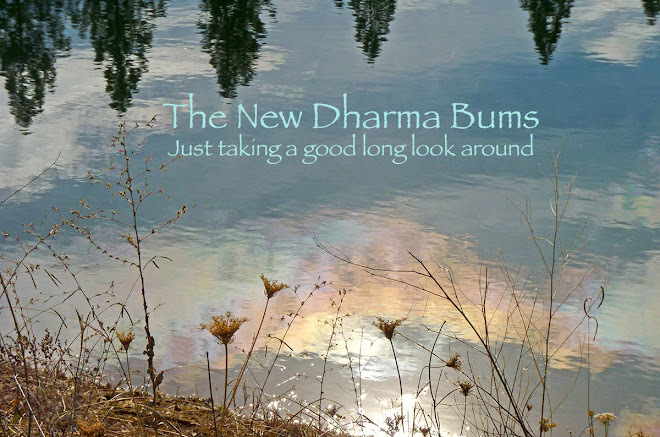 Things continue to unfold with regular ups and downs the way life often does. Good days and bad for my mom. Sometimes there are phone calls that leave us laughing and joyous, when she sounds more like herself and actually seems present. Then there are the calls from my sister that are urgent, stressful, and painful. Sometimes they happen in the same day. This is life at the moment. So, we do what we always do, we look for diversion on our beautiful planet. It doesn't take much, maybe playing with a photo of a cloud, tweaking the saturation to see what it can become. Ah yes. That's what it looked like out there. Magical like a wild white flame. Or running to the west facing windows just past sunrise to see this. These look like anti-crepuscular rays to me. If that's what they are, I will be doing cartwheels (or I would if the pinched nerve in my back would let me). If I had a bucket list, seeing anti-crepuscular rays would be on it. So, I was delighted with this view right out our window. This is what it looked like out front, facing east, just a few minutes later. Now those are definitely crepuscular rays. Always beautiful, always one of my favorite views for diversion. It had been quite a while since we saw the sunrise here. We've had more than a foot of rain since February 1st. That's almost twice the normal average rainfall. It's been gray for so long I didn't know precisely where the sun would rise, it had continued north in the days since the last visible rise. Ah, so there it is, as our planet tilts toward equinox, there it is. Good morning, sun! Thank you for the diversion. I just received an email from my sister. She heard from two different caregivers on Monday that our mom's favorite word is NO! She won't change her clothes, let them wash her, put on her slippers, or do anything else that they ask. NO is the one and only answer. But here she is, two weeks past pacemaker, three weeks past atrial fibrillation, four weeks past vascular dementia and stroke. She's smiling and giving it the best she's got at the moment. We're all still hopeful that she'll reach a baseline that will hold for a while. Monday night, at the new 24/7 Care Facility, my mom's computer is on the dinner table. They are streaming music from the 1940s and 1950s that my sister put on from Pandora. The staff at the facility said they thought the other residents would love the music. I agree. My sister said my mom was singing all afternoon. Well, after all NO's of the day. It's still raining here. Raining raining raining. Cabin fever, my friends, serious cabin fever. Sunrise in suburbia and later sun dog with parhelic circle. So grateful for the beauty. But then Saturday morning the bright and beautiful sun rose in a startlingly blue and cloudless sky. We couldn't believe what the light looked like in our sunlit house. We didn't have to turn on lights for the whole day. We went for a walk. A WALK! It was wonderful to be outside. We went to the marsh and saw fields that are usually dry now suddenly filled with huge rain puddles deep enough for the Green-winged teals to be paddling around looking for something yummy to eat. We saw interesting bubbles rising in these puddles. Not sure why I found them so mesmerizing, but I did. What makes these bubbles in these puddles? I have no idea. This has been quite a challenging winter. And of course, the worst of it has been my mother's declining health. She moved into the 24/7 care facility on Saturday. She has not gotten much more lucid than the days before her pacemaker surgery. I spoke with her briefly on Saturday, and she was as wispy as ever with her heartfelt, "Hello Robin and Roger." We kept the conversation simple. I told her we had sunshine. She thought that was nice. I asked her about the new place she was in. She said, "I'm not going to stay here." I said, "You're not?" She said, "Well maybe just tonight." Oh my heart. So the sunshine lifted our spirits for a day. We loved it. A week of rain is in the forecast. Yeah, wish I had better news to report in every way. First, let me express our gratitude for all of the heartfelt good wishes on the previous post. They mean so much to us. It's truly the best part of the social internet to have these conversations with the kindest virtual friends we know. Thank you. Here is the latest on my mom's health issues. On Saturday morning she lost consciousness while at my sister's. The ambulance was called, and she was taken to ER, where after a few hours she was admitted. We learned that during her previous stay at the hospital last week, her heartbeat was quite low (in the 40 bpm range). She was experiencing atrial fibrillation. Her confusion persisted and she was at a great risk for falling. After three days in the hospital, the cardiologist told my brother and sister that my mom would need a pacemaker to stabilize her heart. Without it, she would continue to pass out and most definitely experience a shattering fall. So, on Tuesday we did a four-way telephone conversation (me here in far northern California, my older brother on the east coast in Virginia, and Michael and Lynn in southern Cal-- the best use of technology ever!). We talked it through, trying to decide if surgery with anesthesia was the right way to go. There is the possibility that the anesthesia will make her dementia worse. We had to balance that with knowing that there is even a greater likelihood that without a pacemaker she will fall. We also talked about what our mother would want. She worked for doctors all of her adult life. She believes utterly in western medicine. If she could choose for herself, we agreed, she would choose surgery and a pacemaker. So, on Wednesday she will have the minimally invasive surgery. We will keep you posted. This has been the most stressful two weeks. Roger and I have been waiting for my mom to move into the new 24/7 care facility, so we can see how well she adjusts to it and plan our 700 mile (1126 km) trip south to see her. Each day there's been a new obstacle and detour. We're hoping that once she's on the other side of this surgery and is comfortably moved in to her new home, we'll know when it's time to travel south. Here is the best part of these past few days for me: On Sunday the phone rang. Yes, it was my mother calling from the hospital. She sounded almost lucid for about two minutes. Then her voice became wispy and vague and faraway again. But it was so incredibly heartwarming and wonderful to hear that "Hello Robin and Roger!" I went outside after the call and looked up at the sky. 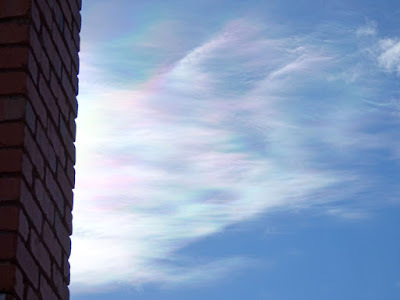 I photographed this iridescent cloud, first one I had seen in quite a few weeks. It was just a wonderful coincidence of joy. BRIEF UPDATE: Surgery started later than expected and lasted longer than expected. The surgeon said it went well. It took longer because an IV needed to be changed. She woke up and seemed a bit more alert right away. My brother said she gave my sister a big smile. We're hopeful. It's too soon to tell how things will go. We'll know more tomorrow. Thank you all for your love, thoughtfulness, good wishes, and kind hearts. Well, as it sadly turns out, my family's assessment of my mother's restored cognitive skills was indeed wishful thinking. Yes, she has had some lucid moments, but at this point my mother has moved quickly into vascular dementia and Alzheimer's. We are all quite devastated by this turn of events. My brother Michael and sister Lynn are, as I type this, looking at residential care facilities to place her. She was released from the hospital on Wednesday and is staying at my sister's. My siblings decided to skip the interim step of a nursing home because they knew it would confuse her even more, and nursing homes are simply not the nicest places for safe and loving care. I have only spoken with her once in the past few days. She has a wispy voice now, full of uncertainty. It does not quite sound like her. She doesn't know where she is. She doesn't know the date. She called a water bottle a shirt. She is surrounded completely by love and compassion, and the only thing that makes any of this bearable is that she is not agitated or anxious or fearful. She is calm and in the land of the unknown. We went for a walk on Wednesday to breathe the clear air and try to mend a bit of our broken hearts. It was a warm and beautiful day, a break between storms. The clouds were beautiful in that awesome way with reflections that made us feel like we're really just spinning in the big universe. We did see a birder who was photographing some dabbling ducks. We asked him what he was seeing, and he told us it was an uncommon visitor to the United States, a Eurasian Wigeon. We were glad to see that too. Life is going to be about balancing the sad with as much beauty as we can find. We thank you for your kind good wishes, friends. It truly helps so much. PS-- My siblings found a wonderful residential care facility for my mom. It's a six-bedroom home with 24/7 care. It's also a hospice home, which means she will never have to move again. We'll keep you posted. Big sigh of relief.